Just got this update from Tesla…. don't think it's on the web yet and was sent only to owners. Big news: battery pack expected to last seven year only $12k to replace if you order now. subject Company Update and New Options Unveiled! As mentioned in a prior update, we delivered our 100th Roadster last month. Since then, we have delivered over 60 more cars to customers and will continue delivering cars at a rate of 15 per week (excluding holidays), rising to 30 per week in the spring. By the end of 2009, we will have delivered over 1,300 Roadsters in the United States and Europe. Tesla is in the fortunate position of being sold out through October this year and we continue to add new sales each month, despite the negative economic climate. As a result, we expect to turn the corner on profitability by the middle of 2009, shortly after we reach our target of 30 per week production rate for the Roadster. Due to our order backlog, it seems that owning a Roadster can be a smart investment. In November, well after the markets crashed, a Roadster was sold at the Happy Hearts Fund auction in New York City for $160,000. The first buyer then donated the car back to the charity and they resold it that same night for $150,000. Many Roadster owners that have taken delivery of their cars have already decided to purchase a second Roadster or Roadster Sport because they like the first one so much. And the Roadster has become the car to own for environmentally conscious celebrities, business leaders, and even royals. 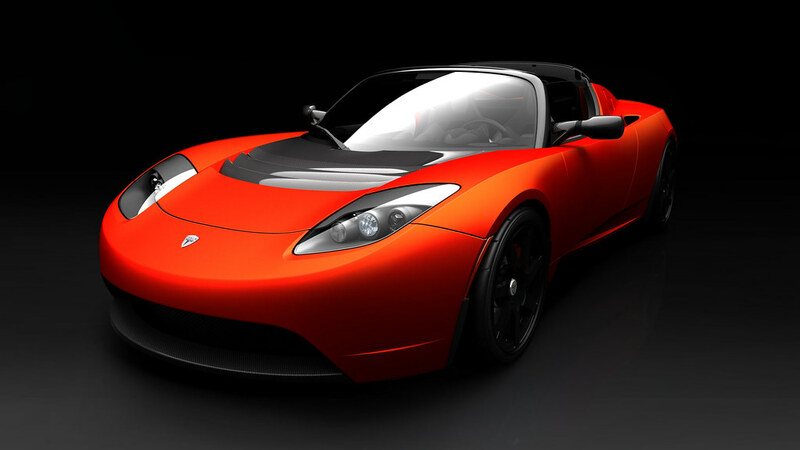 An important factor for many in the buying decision is that by purchasing a Tesla Roadster, they are not simply obtaining the only eco-friendly sports car in the world, they are also helping pay for development of lower cost, mass electric market cars. The same obviously cannot be said if someone were to buy a gasoline sports car from other makers of super cars. As I said in my first blog posting about Tesla several years ago, our goal is to make electric cars that anyone can afford. The Model S, which will be unveiled in a few months, is a big step in that direction with a starting price to consumers of $49,900 (after subtracting the $7,500 federal tax credit). Taking that a step further, I was happy to announce this week that Tesla is working with in partnership with Daimler (maker of Mercedes) to create an electric version of the Smart car. The initial agreement is for 1,000 cars and if that proves to be successful it could expand to tens of thousands of cars. We are honored that Daimler chose Tesla after a detailed investigation of their options. This announcement follows over a year of development and is planned to be the first of a few key partnerships with other auto manufacturers to engineer and produce electric cars. By no means are we trying to keep a lock on the technology – we will do whatever is needed to accelerate the electric car revolution and help end the world’s addiction to oil. We have been hard at work making the Roadster the best that it can be. Since launch, we have been collecting feedback on additional features and services that our customers would like. We are now able to announce and explain a series of additions to the options list that specifically address areas where customers have asked for more choices. This was announced in a separate release so I won’t go into much detail, but the highlight of this selection is a motor with 40 additional horsepower and a handling package with crisper response and higher limits. The Roadster Sport has 15 percent more peak power and delivers 0-60 mph in 3.7 seconds. The handling components in this package will also be available separately. If you are interested in upgrading your not yet delivered Roadster to Sport please contact the Sales team for details. Roadster Sport with optional clear-coat carbon fiber hardtop. and what will it cost to replace?” Our calculations and test data indicate that a Tesla battery should last approximately seven years, depending on driving and storage conditions. The cost to replace a Roadster battery pack today is approximately $30,000, although it will certainly decrease with time (adjusted for inflation) as Tesla and our cell suppliers continue to find innovative ways to reduce cost. With this in mind we have created a battery replacement program that allows a customer to pay up front and in return receive both a significant discount and certainty about the cost. The price of this replacement is $12,000 and is available to all Tesla customers, including those that have already taken delivery of their car. I am going to buy one for my Roadster and I suggest that you do the same for yours. A present value price of $12,000 is a good deal for anyone earning under 10% per year in their long term investments. By the way, I should note that the Model S and Smart EV battery packs will be considerably cheaper due to much greater economies of scale and next generation design efficiencies. We have been developing an Executive Leather Interior that is going to raise the level of luxury in the cabin. You may have seen an early example of this in photos. We are also now working on a clear carbon fiber and leather combination that will take the quality of the interior to new levels. Both of these packages will be available starting in May, and we can retrofit cars that are already built if you would like either of these options. Prototype with executive leather interior. Many of you have asked for the option to purchase an extended warranty, and now you may do so. We are offering an extended warranty that will cover an additional 2 years or 24,000 miles on your Roadster. The price of the warranty is $5,000 and will cover everything on the car except the battery for material defect and workmanship issues. Should you encounter an unexpected catastrophic failure in one of the powertrain components (including the Power Electronics, Motor, and Transaxle), this will be money well spent. The carbon fiber body is one of the many unique features of the Roadster. The Clear Carbon Fiber Exterior Package adds an additional level of sportiness to the exterior appearance of the Roadster and really highlights the lightweight, exotic material that makes up the Roadster’s body. If you like the clear carbon fiber roll bar cover that is on the base Roadster, then you will love this option. Roadster with optional clear-coat carbon fiber accents. Many of the new options are available immediately – even for Roadsters being built this month. A Tesla representative will be calling 2008 model year customers over the next couple of weeks to explain some of the new options in greater detail and answer your questions. Once we have spoken with all 2008 customers we will begin contacting next model year customers to discuss available options. The Owners Area will reflect the changes to the options matrix in approximately one week. You may have noticed when reviewing the optional features that we have removed a couple of items from the list of standard features. Allow me to explain these changes. 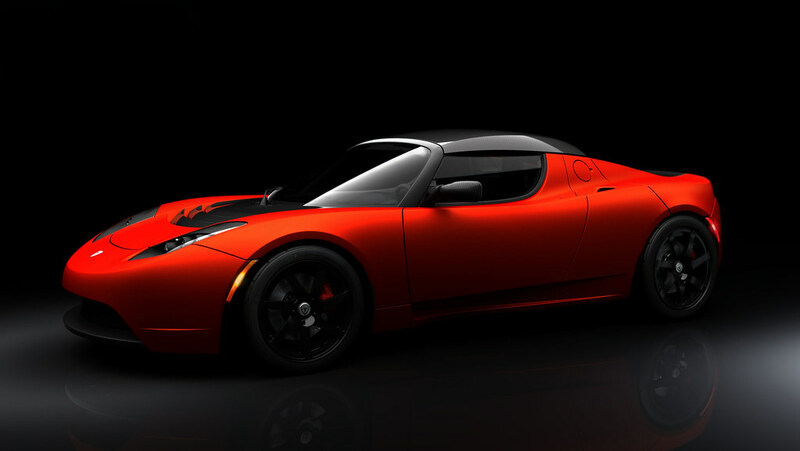 We have selected a new wheel to be the base wheel of the Tesla Roadster. You can see this new wheel in the image of the Roadster below. The original “Tesla wheel” is still available as an option and can be ordered with a silver or black finish. Roadster with new base wheels. The 120V Mobile Connector (MC120) will now be the base connector that comes with the car. This connector allows you to recharge a Roadster six to seven miles every hour, however the average daily miles driven for most customers is only about thirty, so you’ll only be charging to “top off.” A few customers have already been using the MC120 as their only method of charging and it has worked quite well. It also works well for charging at weekend destinations. If you would like faster charging you may purchase a 240V Mobile Connector (MC240) capable of drawing up to 30 amps. At this voltage and amperage level the Roadster will charge in approximately 8 hours. The fastest option via the onboard charger – the High Power Connector — operates at up to 70 amps, which translates to a charge time of about 3.5 hours. This system is designed to be installed in a residence or place of business and is the ideal method for charging a Roadster. Going beyond that, we are working on a long term solution that allows for a 45 minute super charge via an offboard charger connected to high voltage commercial power lines. This would be ideal for long distance travel between cities, as you could drive a few hundred miles and then stop for a meal while your car recharges. We have the charger working in our labs right now and hope to deploy a few test articles along major highways later this year. As you can see, we have been making a lot of progress on the optional equipment front. We have been making similar improvements to durability, usability, and the overall ownership experience of a Tesla Roadster. Many more improvements are still in the works, so you should expect to see continuing progress as time passes — both on cars already on the road and cars not yet built. We look forward to an exciting 2009 with you as we continue to invest in the future. Next Post 10 to 405 traffic? You're kidding?!?! I want one buy my wife does not want to spend 100k on a car. Thanks for sharing this letter, Jason.